By Bhismaraj Ojha/CB Adhikari (KATHMANDU, 13 (RSS)– The Nepali year 2075 BS (April 14, 2017 to April 13, 2018) has set its record as the year hosting the maximum and significant elections in nation’s history. The year witnessed the successful completion of three-tier election from much-awaited local-level polls to federal parliament. Election fervor had gripped the nation throughout the year since the beginning. The first round of local level election was held on May 14. People had got an opportunity to take part in the local elections first time after around two decades. The first six months of the year (since September 18), the country remained busy in holding the local level elections in three phases (May 14, June 28 14 and September 18) and these elections were milestone in implementing the constitution and devolving executive an legal rights confining in the grip of center to local levels. The local-level election was historic in terms of bringing women to power as it has guaranteed 40 per cent women representation at the local governments. The beginning of the year saw change in the government leadership as well as the then Prime Minister and CPN (Maoist Center)’s chair Pushpa Kamal Dahal resigned from the post on May 24, paving the way for Nepali Congress President Sher Bahadur Deuba to assume the post as per the bilateral agreement to head the government on a rotational basis. Likewise, in the commencement of the year, President Bidya Devi Bhandari on April 17 set out for the India visit, as her first foreign visit since her election on the presidential post. The year remained politically noticeable as the impeachment motion was filed against the Chief Justice for the first time in the nation’s history. The impeachment motion registered by the then coalition government of the Nepali Congress and CPN (MC) had not fund its conclusion, however. An unexpected announcement of electoral alliance between the two largest communist parties in the country–CPN(UML) and CPN (MC)– when the people were busy in the Dashain celebrations took them by a surprise. This process is expected to find its logical conclusion on coming April 22 ( Baiskah 9, 275 BS) with the unification between two political parties. Likewise, the first historic elections to the House of Representatives and the State Assembly as per a federal setup were held in two rounds (November 26 and December 7) at the same year. The left alliance stormed to the power with a landslide victory through the twin elections while the democrat Nepali Congress achieved ‘unexpected’ defeat. The Deuba-led government is credited for holding the federal parliament and State Assembly elections. The same government had, in accordance with the constitution, on January 17 appointed chiefs of all seven provinces and announced temporary centers of provinces. Province Assemblies and the Province Governments have been constituted in all the seven provinces following the election to the provincial assemblies. The election to the National Assembly, the upper house of the federal parliament, was also held on February 7, 2018 as stipulated in the constitution. The constitution stipulates for a bicameral federal legislature comprising the 275-member House of Representatives and the 59-member National Assembly. This was a year of elections. A series of elections were held at different times in 2074 BS. UML chairman KP Sharma Oli from the leftist alliance was appointed as the Prime Minister on February 15 based on the votes the alliance garnered in the election to the federal parliament. This is his second stint as the Prime Minister. Then Prime Minister Sher Bahadur Deuba had resigned from the post of Prime Minister through an address to the nation on the same day. The members of the federal parliament took oath of office and secrecy on March 4 and the first meeting of the federal parliament was convened on March 5 after the election to the federal parliament. The election of the President and the Vice President were also held in 2074 BS in connection with implementing the constitution. Bidya Devi Bhandari and Nanda Bahadur Pun were re-elected to the post of President and Vice President respectively. The election to the post of Speaker and the Deputy Speaker of the House of Representatives and the Chairman and Vice Chairman of the National Assembly also took place this year as part of constitution implementation. Also this year, Chief Justice Gopal Prasad Parajuli had to resign from his post after he was dragged into a controversy regarding his date of birth and certificates of educational qualification. 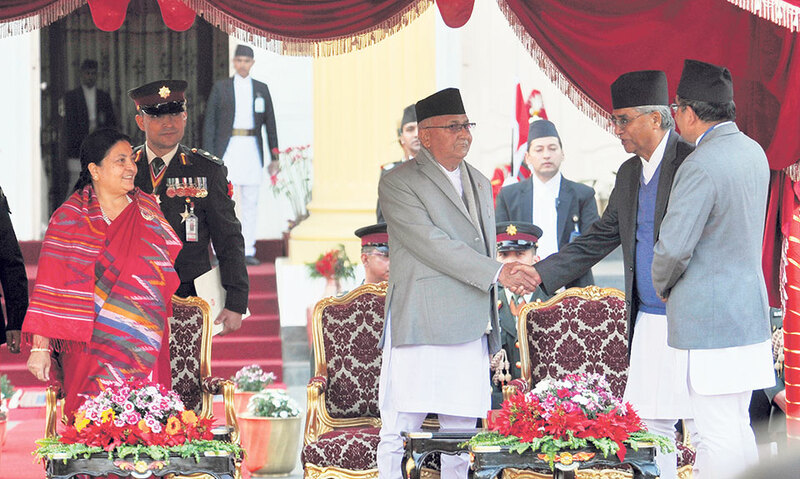 Towards the end of the 2074 BS, Prime Minister KP Sharma Oli paid a state visit to India from April 6-8. This visit by the Prime Minister is considered to have thawed the Nepal-India relations which had gotten frosty after India imposed a blockade on Nepal immediately after the promulgation of the present constitution. Besides the political developments, many incidents resulting in the loss of lives and property also occurred in 2074 BS. Floods and landslides triggered by incessant rains in the monsoon caused a heavy loss of lives across the country. Many people were killed in road accidents also. Fifty one people from within the country and abroad were killed when a plane of the US Bangla Air crashed at the Tribhuvan International Airport on March 12. In the field of sports, the year 2074 BS was fruitful for the country. Nepal got the recognition of the countries qualified for playing one-day international cricket after winning the ICC one-day cricket league. This is a significant achievement for Nepali cricket.